TNCS Elementary Skypes with Students from other Countries! 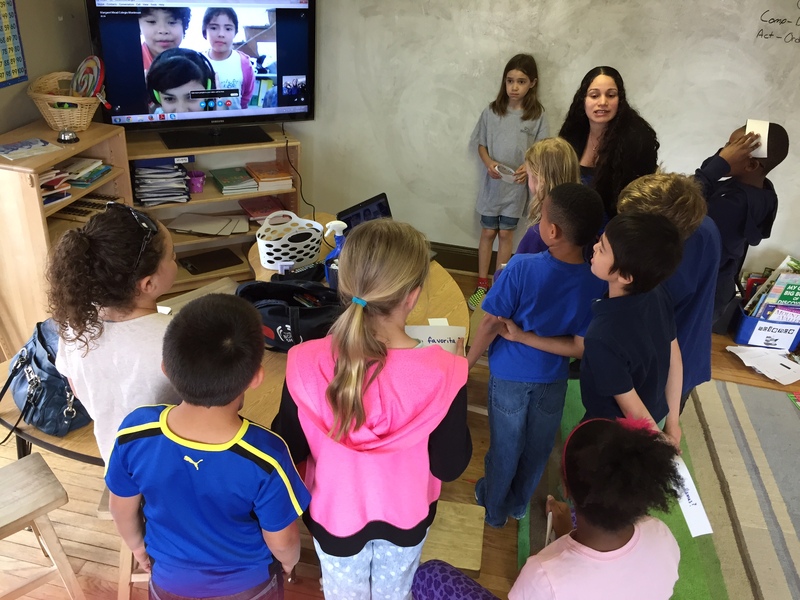 Señora Hodapp and her upper elementary Spanish class hold their first Skype call with the Colegio Margaret Mead in Peru. Other cross-cultural exchanges are also potentially in the works, such as with summer camps with both Spanish and China through groups like Each Futures, who TNCS has worked with in prior years to bring Chinese students to the school. “They have also had individual student exchanges from Spain and China that were very rewarding for everyone,” said Ms. Dansberger Duque. To augment these efforts, Ms. Dansberger Duque has been developing a program for visiting Chinese students to attend TNCS for 2 weeks, with classroom time and tours of nearby historic points of interest, with the help of TNCS Chinese intern Monica Li. The next step was to expand such efforts to Latin America. Ms. Dansberger Duque and Ms. Li came up with the idea for a series of Skype chats as a way to launch their bigger programs. These could take the form of class to class, teacher to teacher, family to family, etc. “The idea behind the chats is to provide options for schools to build a relationship with us that would instill trust and inspire families to come visit us and vice versa,” said Ms. Dansberger Duque. As it is turning out, though, the Skype chats are in and of themselves an enormously beneficial way to make languages and cultures come alive for TNCS students. Intercambio internacional—everyone was all smiles for this fun and rewarding class! As a native of Bogotà, Colombia, Ms. Dansberger Duque has a deep understanding of Latin American culture and was able to prospect 14 schools across Central and South America and the Caribbean that were both Montessori based and/or multilingual as well as interested in building a relationship with TNCS. “The first school I found was the Montessori British School in Bogotà, Colombia. They teach Spanish, French, English, and Mandarin. They already have an established exchange program with China and are interested in setting one up with us. 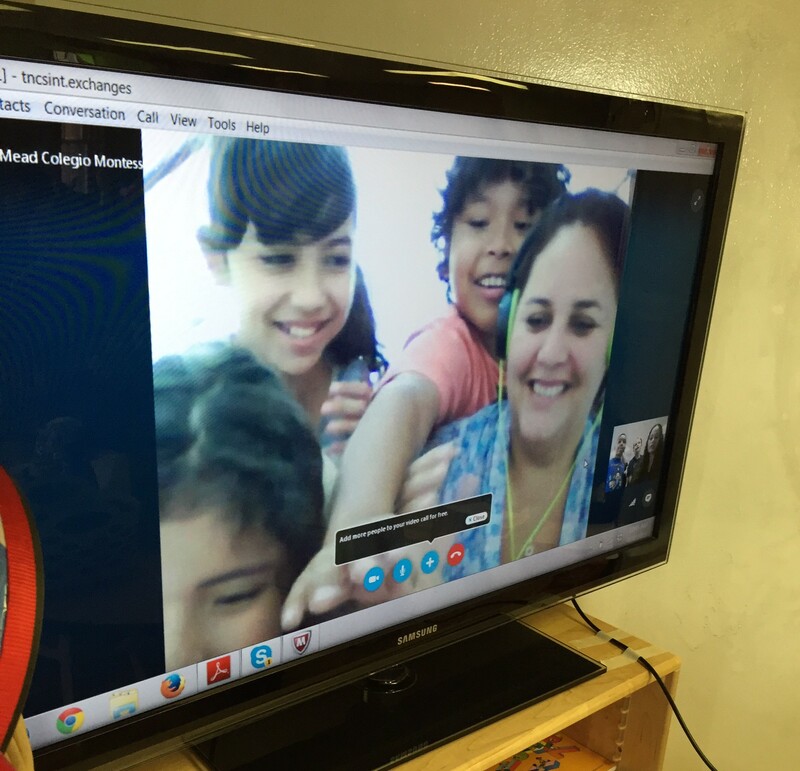 The Colegio Margaret Mead in Peru, while having maybe the least amount of technology resources compared to some of the other schools I contacted, was the first one to come through and commit to a specific date and time to do a classroom chat,” she said. As mentioned, Colegio Margaret Mead was the first school TNCS students connected with, and the unqualified success of this chat will pave the way for regular exchanges of this kind. On Thursday, April 30th, TNCS 3rd- and 4th-graders gathered to find out all about their new Peruvian friends. They were each prepared with written questions and took turns in front of the screen, as did the students on the other end. What grade are you in? What’s your favorite sport? What’s your name? How old are you? One especially rich moment was when the Peruvian students asked TNCS students in Spanish how to say “hello” in Mandarin. Think about that for a moment, because it’s tremendously impressive that TNCS students can field a question in one non-native language about a separate non-native language altogether. I think this program is important for TNCS students because it is through meeting people of other cultures that people build bridges. By promoting an international language and cultural community students become accustomed to a world view of inclusion and diversity as the norm. While it obviously has long-term personal, academic, and professional benefits in a world market, in my opinion, its most important quality is that it dissolves the idea of foreign and creates a sense of unity and appreciation in the diversity that exists in the world. It helps to mold our young ones into understanding world citizens. That is something difficult to come by from secondhand experiences like textbooks and movies. The next chat will take place Tuesday, June 2nd with a class from the British Montessori School in Bogotà. The native Spanish-speaking students are also fluent in Mandarin and English, so all three languages will be spoken during this call, with an emphasis on Mandarin. Ms. Dansberger Duque says, “There are schools in Argentina, Costa Rica, Panama, Grand Cayman, and Bolivia that have also expressed interest. The school in Grand Cayman, Montessori by the Sea, has opened their summer camp experience to our students.” TNCS is fortunate to offer these extraordinary programs thanks to the ongoing hard work of our TNCS ambassadors! TNCS Primary Students Have Something to Crow About! Primary teacher Maria Mosby hatches a great idea for a class project! The New Century School‘s primary Montessori program is truly special, inspiring children to be self-directed and independent yet truly community-minded individuals through hands-on engagement with their world. Ms. Mosby said of the idea for her initiative, “Señora Salas and I had been talking to the children about where things come from as well as doing a lot of food preparation work (including egg slicing). So I wanted to do a bird unit and let them actually see and participate in the raising of these chicks so they could understand where our eggs come from. We had to talk about the difference between the eggs we eat and the eggs that are fertilized with potential chicks inside of course!” Eggzactly! At some point, most other TNCS classes dropped by for a peck. Make that peek. On the verge of hatching—so eggciting! She has been very happy with the company and their responsiveness. “It has been a wonderful program. [Mr. Phillips and Ms. Samata] are on call and answered my emergency chick and egg questions right away,” said Ms. Mosby. The students got to watch the chicks grow for 21 days inside the egg and for 7 days outside the egg to develop an understanding of emerging and then early life, from “egg tooth” to first feathers. Meanwhile, they also enjoyed observing Olive and Miamaura grow and change. Wait—inside the egg? “They are fascinated when we candle the eggs and what we’ve been learning about in books about the growth of the chick embryo comes to life,” said Ms. Mosby. “Candling” involves a special light that reveals what is happening within the egg. They’re getting bigger by the minute! Mrs. DuPrau’s class pays a visit. Last day with chicks . 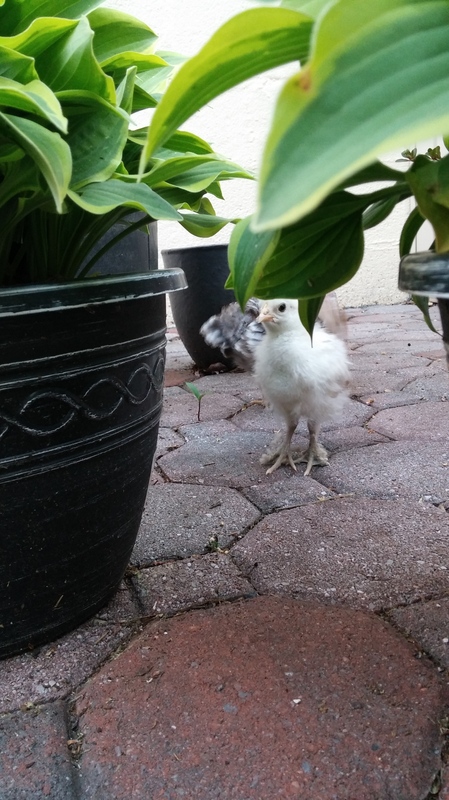 . .
As luck would have it, three of the chicks hatched the night before Ms. Mosby’s beautiful Mother’s Day breakfast on May 8th, and the rest during that happy occasion! What more fitting celebration of parenting? Indeed, Ms. Mosby’s students developed some very nurturing ways as a result of this wonderful project. “My students have been really interested in doing individual projects about birds, and are so gentle, caring, and protective of the chicks,” she said. They named the new hatchlings “Peep,” “Foxy,” “Oreo,” “Thing One,” and “Thing Two.” Awwwwwww! Many other TNCS classes stopped by to visit, and Mrs. DuPrau’s class even helped maintain the brooder, which is where the chicks live soon after hatching (after 24–48 hours in an incubator). The brooder features a heat lamp and water and feed bowls and chicks are added one at a time. Think of this as analogous to the Montessori mixed-age classroom, where the new “chicks” learn from the seasoned pros! Enjoying Ms. Mosby’s backyard before returning to the coop. Dr. Carisa Perry-Parrish, a developmental clinical psychologist and faculty member at Johns Hopkins Division of Child and Adolescent Psychiatry, specializes in emotional regulation strategies for children and adolescents. Last month, The New Century School hosted the latest workshop in Head of School Alicia Danyali’s parent enrichment series. 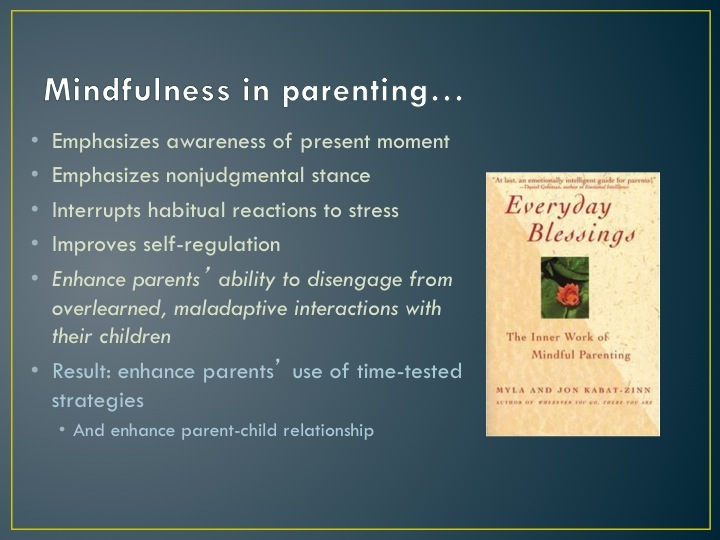 This helpful, enlightening presentation on Mindful Parenting was given by Dr. Carisa Perry-Parrish, a developmental clinical psychologist and faculty member at Johns Hopkins Division of Child and Adolescent Psychiatry—and a TNCS mom herself! The workshop was very well attended, but many who expressed interest were unable to be there. This synopsis of the event includes lots of Dr. Perry-Parrish’s published research, with her permission. “Dr. Perry-Parrish specializes in improving emotion regulation in children and adolescents. Her clinical interests emphasize practicing and promoting evidence-based care, including acceptance and mindfulness-based interventions to improve self-regulation, parent management training for childhood noncompliance and attention deficit/hyperactivity disorder, and cognitive-behavioral therapy for youth anxiety/depression.” For this particular presentation, she shared mindfulness practices to help children and parents alike cope with life stressors and improve their interactions, thereby decreasing the stress in the whole family’s life. Although she does focus clinically on emotional disorders, these positive parenting techniques are applicable and promise enormous benefits to everyone along the continuum of emotional experience. So let’s get to it, right? The presentation began with an eye-opener right off the bat, which is that emotions are not simply arbitrary reactions to catalysts or reflections of our inner states but serve real functions. We evolved to be emotional beings, after all. So when our kids display emotion, they really are telling us something about their current needs. In a nutshell, we consciously and unconsciously use our emotions to fulfill particular goals. Emotions are social cues. Kids face a lot of stress—academically, socially, recreationally—but that stress, and the emotions it elicits, can be positive in some ways. “Every day is full of emotional challenges and opportunities for emotional growth,” said Dr. Perry-Parrish. 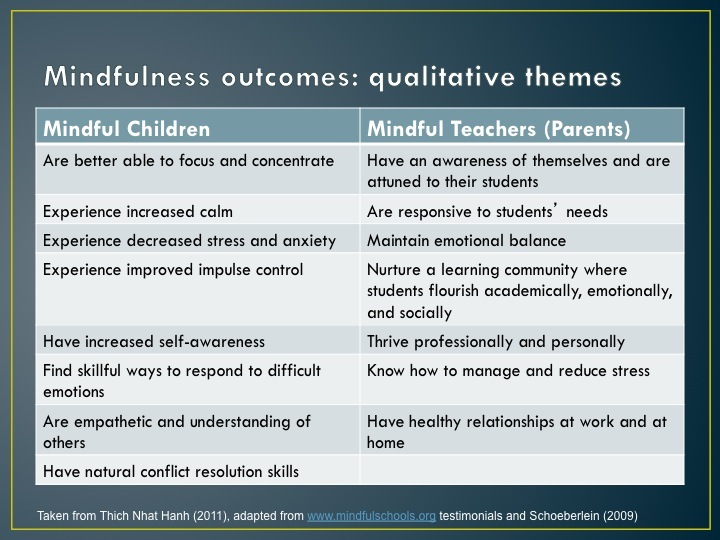 Here she drew a parallel between TNCS’s emphasis on child self-advocacy and independence, noting that mindfulness is certainly a very complementary practice. 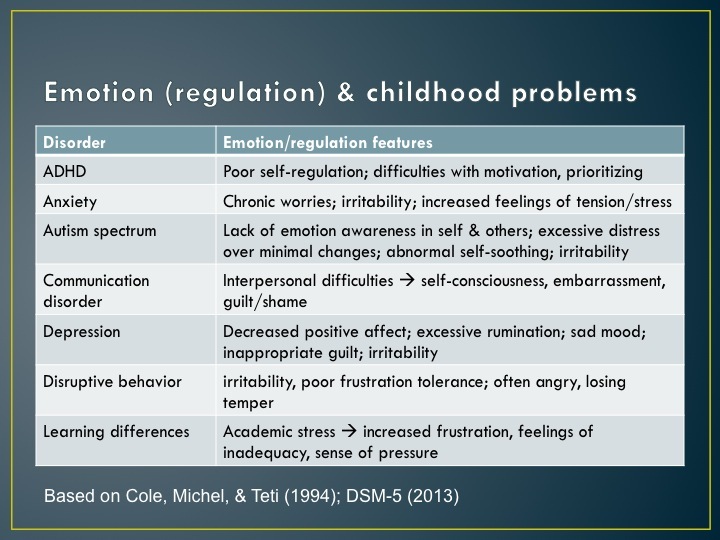 When emotions are not regulated, or cognitive disruptions lead to intense emotional states, these disorders not only present tremendous challenges for the child, but the parent also, who is, for example, trying to get the child out the door to school on time. Even in the absence of a so-called “problem,” parenting is stressful for any number of reasons, including that on-time-to-school bugbear. Dr. Perry-Parrish next described three parenting styles we commonly adopt in such situations: Dismissive (“Get over it!”), Disapproving (“You shouldn’t feel that way.”), and Laissez-Faire (“Anything goes.”). The message implicit in the first two examples is that the child’s feelings are not valid; however, recall that emotions serve very important functions. What underlies the emotion is what is important here (for example, “I don’t want to do what you’re asking me to do.”). In the third approach, no limits are set for misbehavior, which does not help the child sort out his or her feelings. A fourth style, called “Emotion Coaching,” validates and accepts kids’ feelings while balancing the need for limits. This philosophy is backed up by decades of research and testing by psychologist John Gottman (among others), who found that children who were emotion coached were more successful as adults in peer friendships, gainful employment, and academic performance than were children parented in ways that focused on misbehavior without taking the emotions and why they were happening into account. A parent using emotion coaching is empathetic without condoning negative behavior. Inherent in the concept of emotion coaching, as the word “coaching” gives away, is that regulating our emotions is a skill we can be guided in and cultivate. Heard of Walter Mischel’s Marshmallow Study? In it, kids who were able to delay the gratification of eating a gooey, delicious marshmallow for a period of 14 minutes, grew up to be socially and professionally well adjusted, have a lower body mass index and greater psychological well-being, and be less likely to misuse substances. “Children were most successful when they tried to occupy their attention with something else—make up a song, say, or turn their back on the marshmallow—or transformed the object of desire in their mind, perhaps by imagining it as a piece of cotton or pretending it was smelly or dirty. How children were paying attention could mean the difference between an automatic response and a delayed response reflecting self-regulation,” said Dr. Perry-Parrish. “We each have different capacities, but I think there’s a way to optimize what we’re naturally endowed with . . . And that’s where I think mindfulness can play a nice role,” she said. 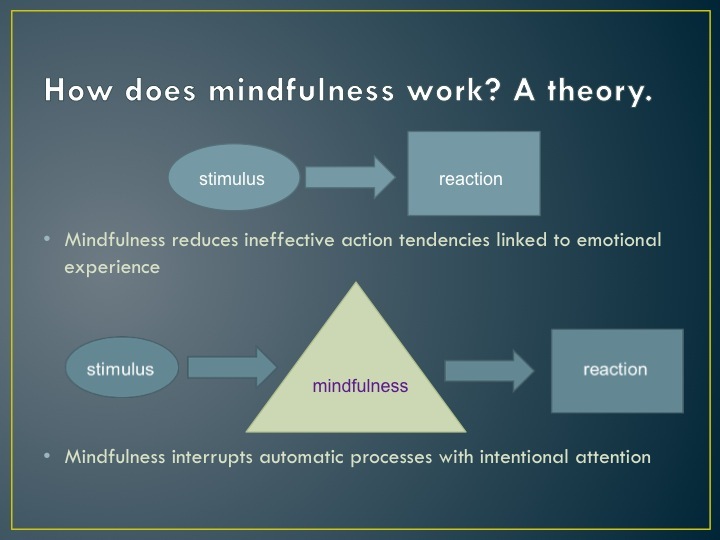 Mindfulness is, basically, practicing awareness/paying attention with three key components: it’s moment-by-moment, it’s non-judgmental, and it’s intentional. It is in sharp contrast to the mindlessness of automatic responses and assumptions, which is a waste of our already limited resources and energy. To illustrate, she walked us through a brief mindfulness exercise—noticing all of the sensations involved in eating a raisin very slowly and using all of our senses to experience it. This not only helped us see how much of the experience of eating a lowly raisin we were probably usually missing, but also demonstrated how challenging paying attention can be when we are so used to our brains spinning like hamster wheels during the waking hours. “But specific exercises give us opportunities to practice noticing without judging,” said Dr. Perry-Parrish, who was emphatic about not liking raisins or dried fruit in general. 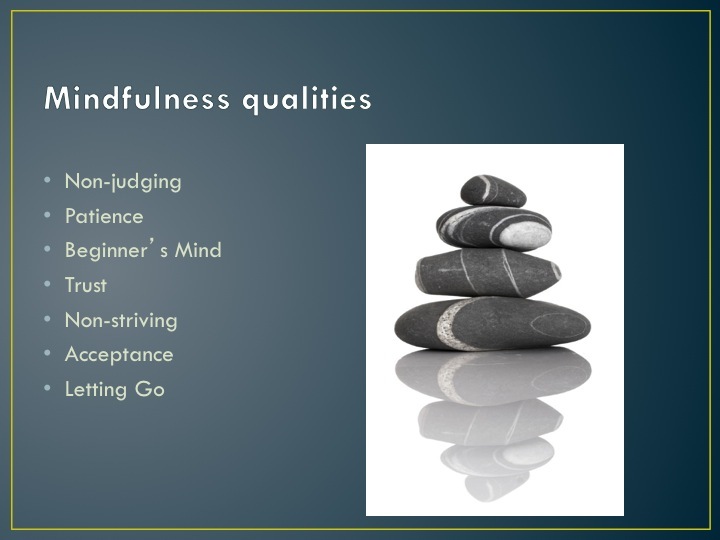 “When we are not fully present in the moment, we miss opportunities to discover what works,” she continued, followed by providing the list of mindfulness qualities shown at right, that we can try to cultivate. “Beginner’s mind” is akin to looking at something with “fresh eyes,” but the other terms are self-explanatory (albeit not all that easy to practice regularly!). And here’s where it all comes together: interrupting our habitual reactions to stress to communicate in a chosen and more effective mode. “Stress hijacks the moment and cuts us off from our internal sources of wisdom,” she said. “Mindfulness is going to be the best supporting actor for what we already know how to do as parents.” She used yelling as an example. We already know that yelling isn’t effective, so why do we do it? Mindfulness can give us the reset to handle the situation calmly and attentively. Dr. Perry-Parrish gave some very useful techniques to begin cultivating your mindfulness skills, including starting a “meditation diet,” pausing to attend to your child with all of your senses, putting yourself in your child’s shoes, deep breathing, having 10–15 minutes every day of one-on-one time with your child, and doing yoga together. Immersed also offers several mindfulness websites and articles under the Resources and Links tab. When parents engage in healthy human interactions, children reap those benefits and then pay it forward. The implications for society are huge. . . and quite wonderful. 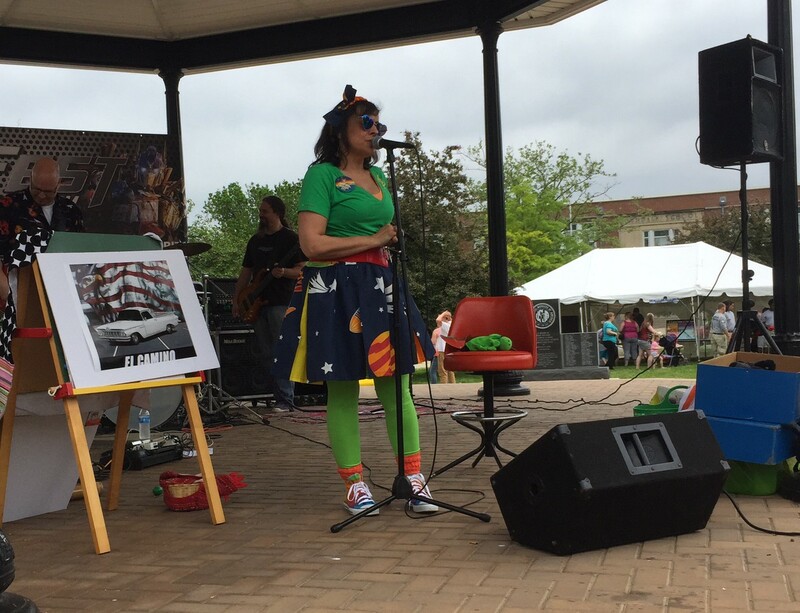 Planet Uptune Debuts CD at Dunfest 2015! Angela Lazarony is founder and lead singer of kids’ band Planet Uptune. 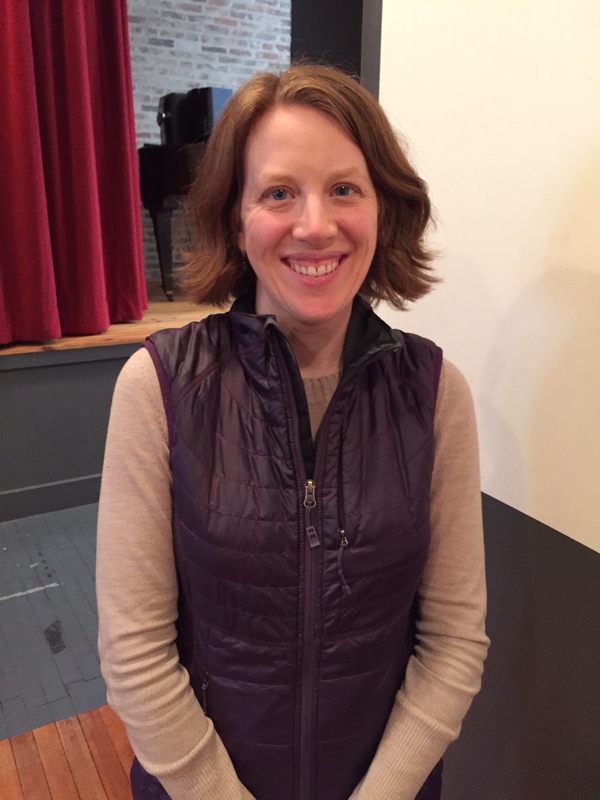 Kids’ band Planet Uptune is the pet project of Angela Lazarony, who is otherwise known to The New Century School community as one of TNCS’s original primary Montessori teachers. She founded the band back in 2008 and uses a rotating roster of Baltimore’s finest musicians to lay down the original tunes she writes and sings. 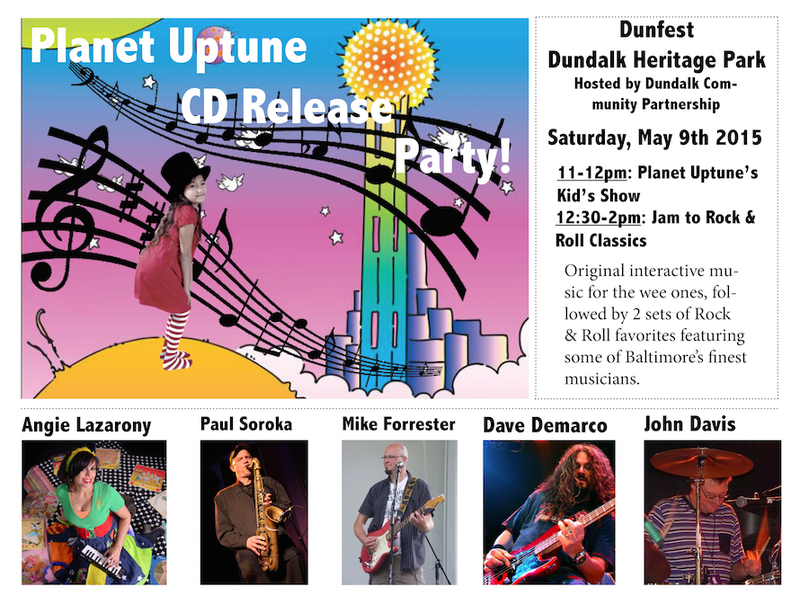 Planet Uptune debuted their new CD Saturday, May 9th, at Dunfest in the Dundalk Heritage Park. For example, in her latest show, which was a performance and CD release party at Dunfest in Dundalk’s Heritage Park, she was thrilled to have bassist Dave DeMarco of progressive rock band Crack the Sky, the Dave DeMarco Band, and others; world-renowned jazz saxophonist Paul Soroka, luthier and gutarist Mike Forrester, and John Davis, also of the Dave DeMarco Band. The CD is called “Welcome to Planet Uptune” and was recorded with additional special guest musicians at Invisible Sound Studios in Highlandtown (a.k.a., the Guitar and Amplifier Museum). How children see a certain thing is sort of the make-up of each song, and, even for adults, revisiting this wonderful, fresh perspective on the world is not only fun but also rejuvenating. Take the song El Camino, for example, which Ms. Lazarony sings with a lively Spanish accent a là Carmen Miranda. “The headlights are like eyes; the taillights are like horns . . . My ’59 El Camino!” Can’t you just see it now? Very cleverly, each stanza ends not with an “olé!” but with a chorus of “Chevrolet!” Each song demonstrates a different musical style; her range is amazing. We go from the Latin beats of El Camino to blues in Haircut Blues to nursery rhyme turned rock song Dr. Foster—and lots more. Ms. Lazarony’s onstage persona is equally fun. With lots of colorful scarves and other accessories in addition to a tailor-made galaxy-patterned dress, she is really out of this world. “I love to play live with other musicians—it’s a lot of fun!” she said. “And I like for children to see different kinds of music.” Videos from Dunfest are posted below, but do yourselves a favor and get the CD*; your kids will love it and so will you! The audience was asked to “paint a rainbow” with crepe paper during the performance of that song. TNCS students were out in force to support Ms. Lazarony! Lots of former students were also in attendance! This next one is well known to many TNCS primary students past and present, who have learned all about the life cycle of butterflies! *To order “Welcome to Planet Uptune,” please email lazarony@thenewcenturyschool.com to purchase the CD for $10 and pick it up at TNCS. In a few weeks, it will also be available on iTunes CDBaby and other digital distribution sites. 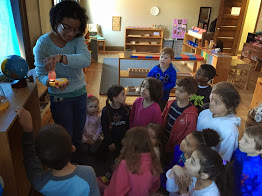 Gilman School Seniors Visit TNCS for Some Spanish Fun! May has finally arrived, and you know what that means—Cinco de Mayo is but days away! Accordingly, The New Century School has been ramping up Spanish language activities, and Immersed is here to bring you up to date (that is, al día) on all the goings on! 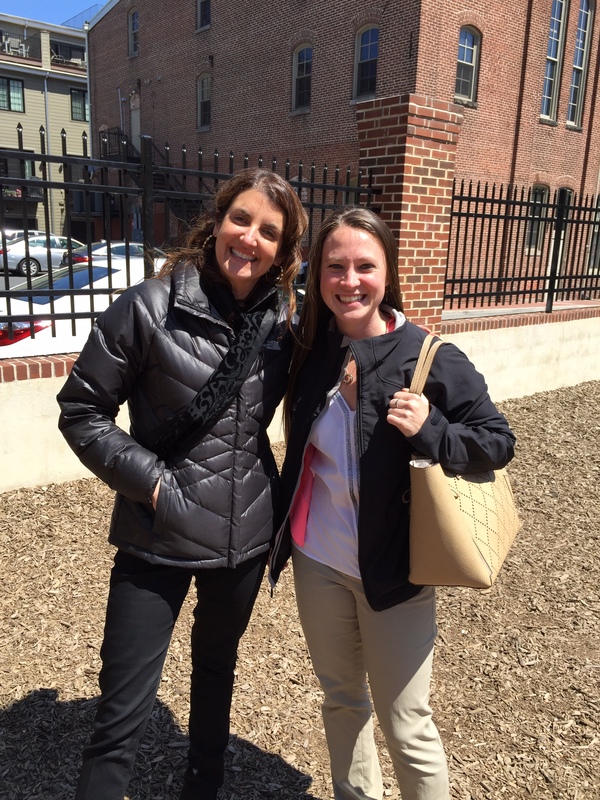 TNCS and Gilman forged a very productive partnership! Last week, TNCS Head of School Alicia Danyali invited senior Spanish conversation students from the Gilman School to speak with two TNCS Spanish teachers for a class project. Accompanied by instructor Erin Butler, the Gilman students were primarily there to complete their interview assignment, but during their time on campus, they also put their language skills to use by interacting with TNCS students, which was to everyone’s mutual benefit. “It is important that our students make connections with older students who are competent language learners as role models and to find opportunities to be ‘risk-takers’ with others willing to explore communication together without feeling judged,” said Mrs. Danyali. The guys from Gilman participate in a little fútbol action on the TNCS playground! Gilman girls speak to a captive audience of TNCS girls. Head of School Alicia Danyali briefly describes TNCS to the visitors. The idea for this very fruitful exchange came from Ms. Butler, who has taught Spanish at Gilman since 2012 (with a hiatus in 2013 to complete a Fulbright grant in Peru, where she taught and completed a research project). For the last quarter of her senior conversation class, students complete a series of interviews with native Spanish speakers who now live in the Baltimore area in order to to both practice their language skills as well as to gain a better understanding of the community. She explains, “The students are paired in teams of two, and each group is responsible for conducting an interview and writing a reflection paper. Our interviews have taken place across the city, and we have met people from various countries and cultures. Students ask questions about the person’s life, family, job, transition to the United States, what he/she likes and dislikes about living here, etc. We have done interviews with nurses, teachers, business owners, scientists, and more.” For their visit to TNCS, the seniors interviewed Spanish Language Program Director Jennifer Hodapp first, followed by a chat with Pre-Primary Spanish Immersion Lead Teacher Johanna Ramos. Spanish Language Program Director Jennifer Hodapp was first to be interviewed. Gilman students were able to improvise a new line of inquiry on learning that Sra. Hodapp was actually born here. Ms. Butler was very gratified to see her students thinking on their feet! Ms. Butler’s approach to teaching another language closely parallels TNCS’s 5 Cs approach. “I believe that students should be given as much contextualized exposure to the language as possible,” she said. “The purpose of learning a language is to be able to use it to communicate, so what’s a better way to learn and practice than by having a conversation with a native speaker?” ¡Bien dicho! She chose TNCS as an interview site quite deliberately, having done a Spanish internship during college at a bilingual immersion charter school. “I saw firsthand how amazing the program was, and when I heard about TNCS, I really wanted my students to have the opportunity to see and learn about the type of education that the school offers,” she said. One thing is certain—TNCS will continue to build on its language program and open up new worlds for participants. “I would love to explore other opportunities for the students to communicate with native speakers as well as those experienced in learning other languages,” said Mrs. Danyali. Watch the video below to see some of the interview with Srà. Hodapp in action.